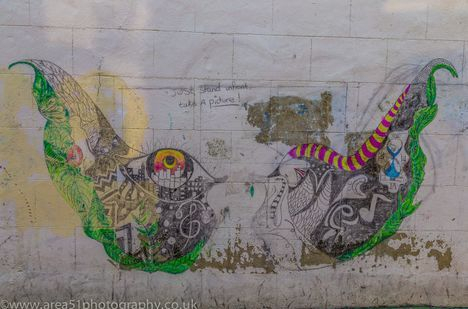 I have been trying for years to get permission to paint public walls but there are few in these areas who still get confused between street art and graffiti. 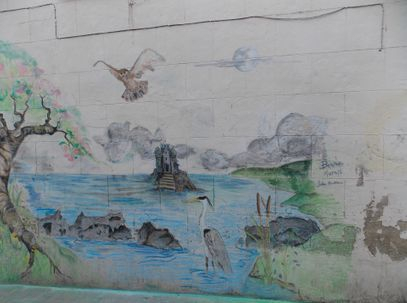 Unfortunately, those few tend to be the local authorities so I started using chalk and pastels to create public art which, being non-permanent, the people in charge were much more open to. Now, I know there are a lot of great artists in this area and some of them had mentioned that they would like to have a go at creating some street art, so I thought ‘why not have a street art festival using nothing but chalk.’ My original idea was to have people working on the pavements and when I approached the local authorities they thought it was a good idea. They told me that I would need permission from The Highways Agency to chalk on the floor and permission from the landlords to chalk on any walls. Walls?? 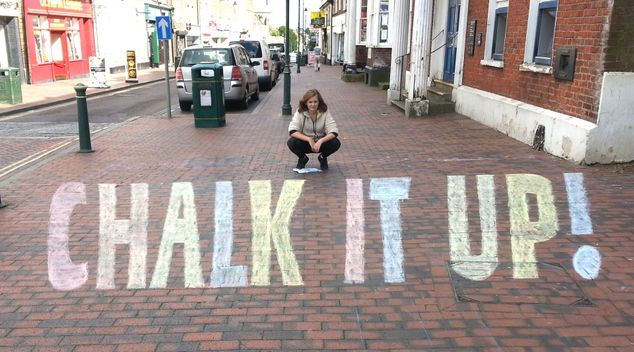 I double checked that they had no objection to us chalking on walls and immediately started to seek out permission from the building owners of Sittingbourne High Street. 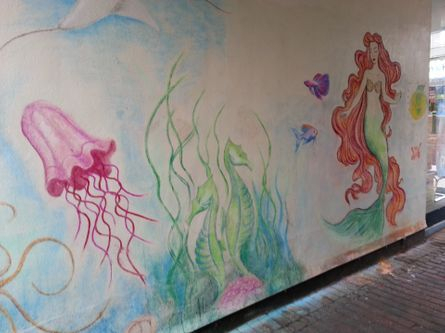 The shopkeepers that I approached looked at me as if I was mad as I tried to explain what I wanted to do to their walls. ‘But it will just wash away in the rain’ they said to me. ‘I know,’ I said ‘I still want to do it!’ They had nothing to object to. They just thought it was a bit weird that there was going to be an arts event in Sittingbourne! I applied for and received a grant to cover expenses from the very lovely people at Ideas Test – a Creative People and Places initiative for Swale and Medway. I have applied for arts grants before and it is normally a very long winded and complicated process but Ideas Test made it really simple, which is how it should be. I then went about putting out a call to artists. My original idea was to involve around 15 artists that I knew and maybe a few other, but I was absolutely overwhelmed by the response from social media. My idea started to grow and the more I spoke about it and realized that others were getting excited about this the more I got excited about it. For the two or three weeks leading up to the event I threw myself into convincing as many as I could to join in and help do something positive to our High Street. This wasn’t easy! Artists are notoriously terrible at replying to messages and generally go through life with little thought to organisation but a lot of hope that things will work out for the best – me included. Some very organised and professional artists filled out the forms promptly and returned them to me in plenty of time; others took a little more chasing (you know who you are)! The week leading up to the event it was all go and I couldn’t have organised things without Jaime’s help. I had put up the posters, ordered the chalk, got the permissions and put everything in place, but this was new ground for me. I had never organised a festival before. What if no-one turns up? 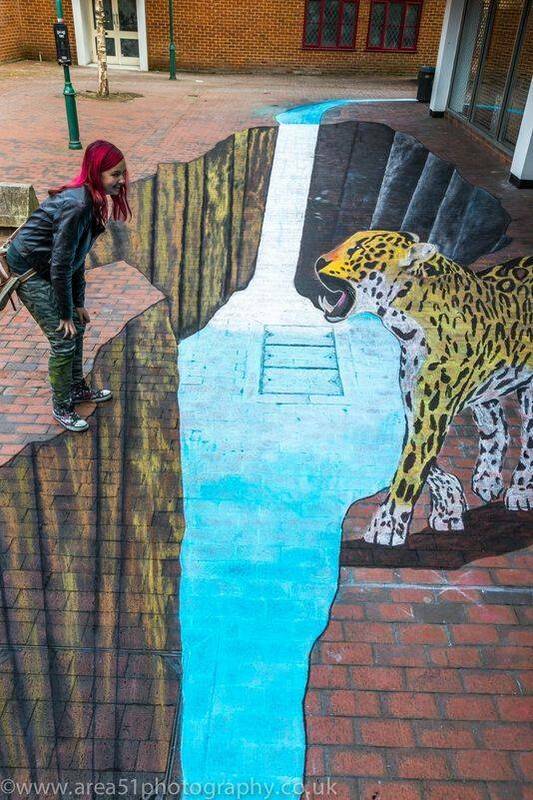 What if there isn’t enough chalk? What if it rains? For weeks I had confidently told people that I had booked good weather for that weekend but in the few days leading up to the event I was as nervous as a long tailed cat in a room full of rocking chairs as I checked all the weather reports. All of a sudden it seemed the weekend was here and, miracle of miracles, the forecast was good. 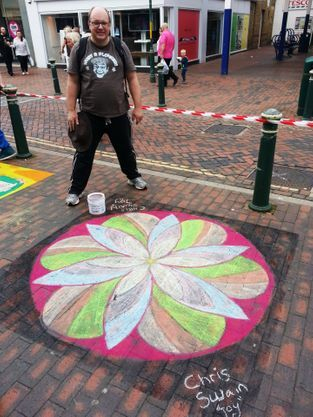 I arrived early at the High Street and was amazed to see that some of my artists were already there and looking keen. 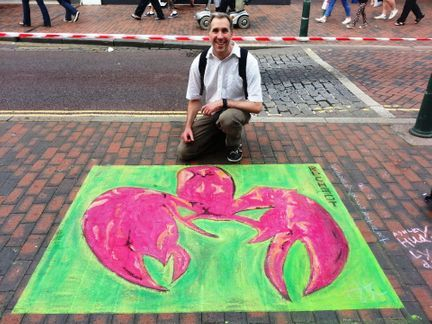 We started to set up and before I knew it I was surrounded by artists all eager to get chalking. I’ve got to say that all my artists were amazing. They all knew where to go and what to do and many of them had been working on their plans all week. I had 50 registered artists before the event. A few dropped out at the last minute due to unforeseen circumstances and there were a couple of nervous no-shows on the day but there were still over 40 registered artists who turned up over the weekend and put on a fantastic show. 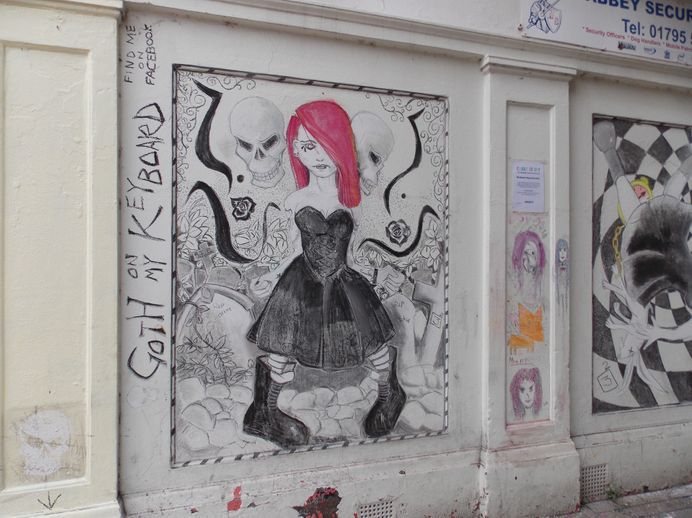 Up near the Edinburgh Woollen Shop I created artwork in the bricked up windows with Mark Thatcher and Kevin Ralph working beside me. Julie Bradshaw, Dave with his bad back and Amber Marie-Bates created a beautiful landscape and butterfly wings opposite us. At the top of the High Street my ex-assistant at Marvellous Murals, Chloe Epps (Chloe left to have a baby), created a Manga inspired design on the side of JC Rooks. Richard Squarecube, left to his own devices, created his Goth on My Keyboard character on the paneling beside Haswells Coffee Shop but said that he was a little lonely on his own so soon roped in members of the public to help him. 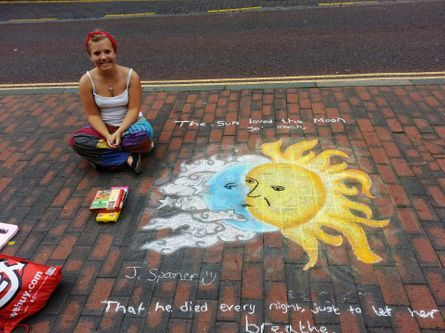 I would like to say a big ‘well done’ to my pavement artists who were very nervous. They had never done anything like this before and they were right in the public eye as you couldn't miss their spectacular artwork in the middle of the High Street. 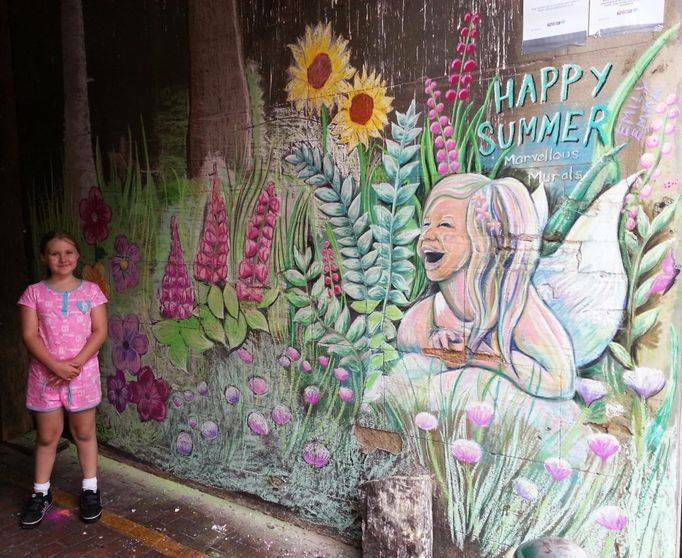 Further down the High Street You could find Emma Foxley and Emily Quincey who created a beautiful floral design around the little girl that I had chalked in the alley several months earlier and gave her a little make-over and fairy wings which tied the whole design together. 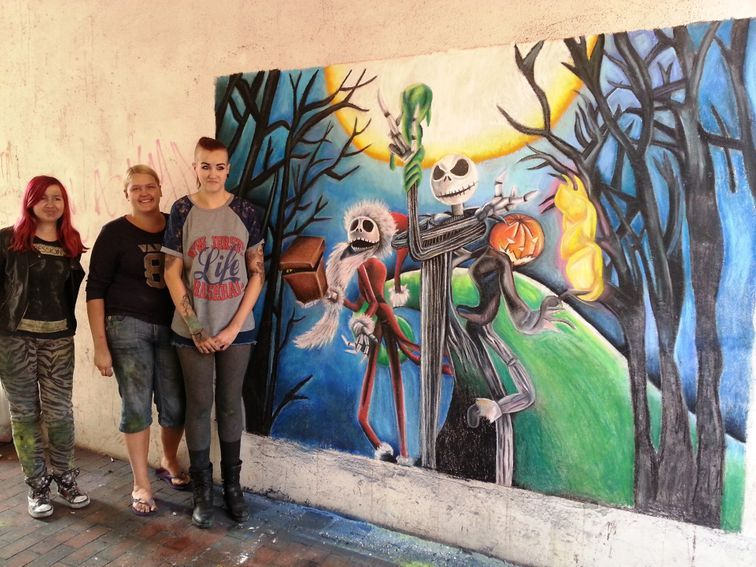 The Hanson sisters, Mel, Louise and Nazine created an incredible scene from The Nightmare Before Christmas in the alley beside Pope & Co. This was complimented on the wall opposite by the tattoo style artwork of Jesta Sage. 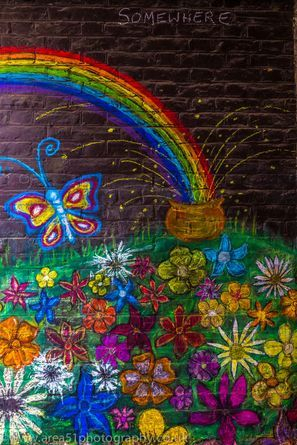 I think, of all weekend, the most fun alley was that of Sioux Peto and friends who really got the public involved in creating a kaleidoscope of colourful flowers in the alleyway alongside the Jewelers. I have had several reports saying how friendly the ladies here were with their singing, dancing and enthusiasm. It sounds like they had a whale of a time. 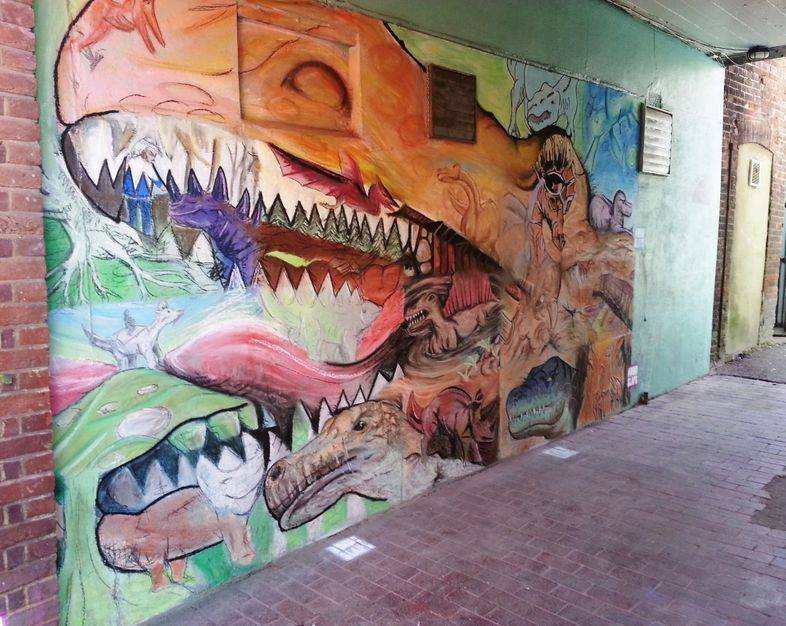 Towards the bottom of the High Street in the alleyway beside The Tanning Salon were the fantastic Dinoslaps. To be honest I was a bit apprehensive when I saw what these lads had planned. It was 20 dinosaur pictures that, when put together, made one big T-Rex head and had a lot of detail in it. On that Saturday they turned up and worked really hard till late in the day to get it finished and it looks excellent! Their team was really professional and had the public joining in chalking big dinosaur footprints on the floor. 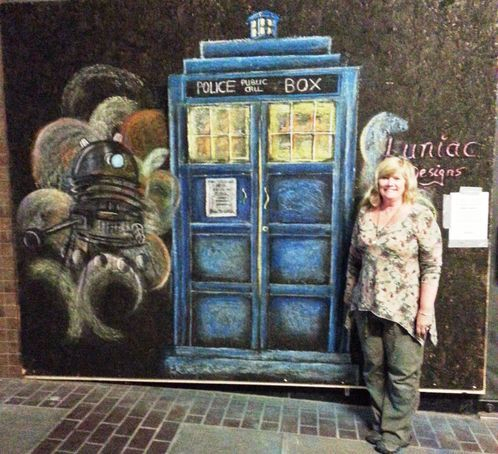 Right at the bottom of the High Street was Nikki Baker of Luniac Designs who was working in the Bell Centre creating a Sci-Fi spectacular with help from Natalie Morrow. 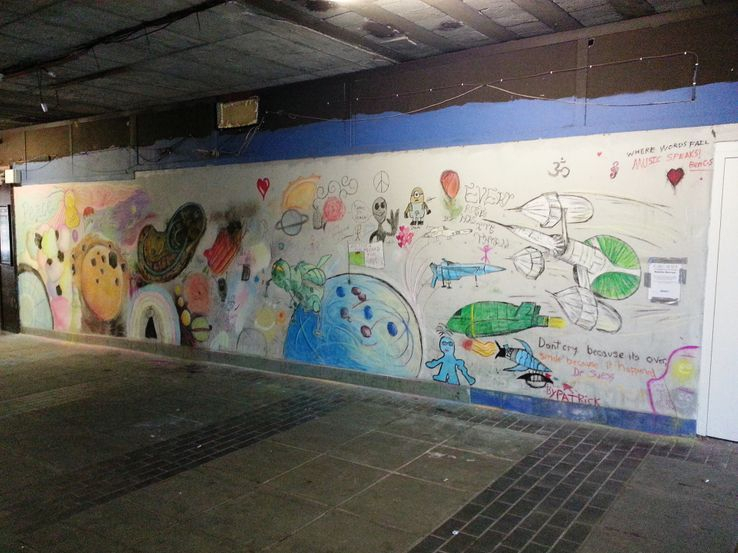 Nikki chalked a life-size Tardis and Dalek on one wall and on the opposite wall they created a whole galaxy of spaceships and stars which the public helped with. Most of the artists involved had never created street art before and for a lot of them chalk and pastels was a new medium as well so they were understandably nervous about creating work in the public eye, but every single one of them excelled themselves and, I think, had more fun than they ever imagined. The whole weekend worked really well and there was a genuine excitement in the air. Saturday was really busy and it was great to hear all the positive comments from the public. The many artists were quite spread out along the road and it was good to see people exploring the entire length of the High Street to make sure they had seen them all. 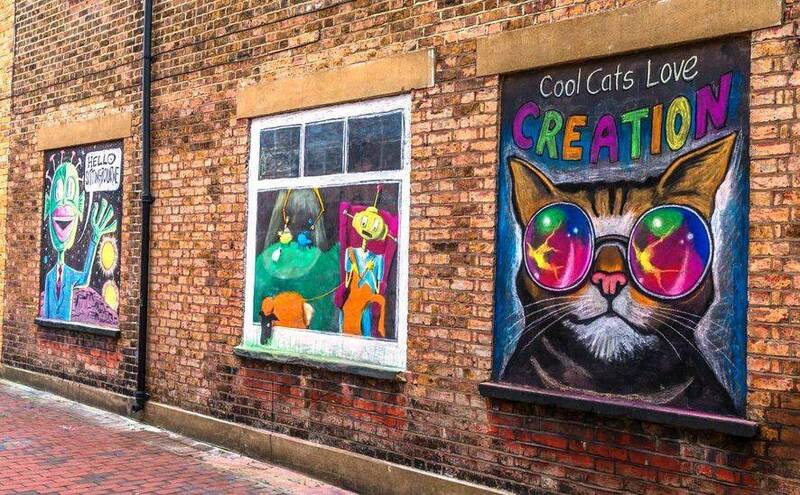 I got everyone set up then made a start on my Cool Cat window. I hadn’t even finished sketching it out before I had a call from Nikki Baker who was being threatened with arrest for criminal damage. 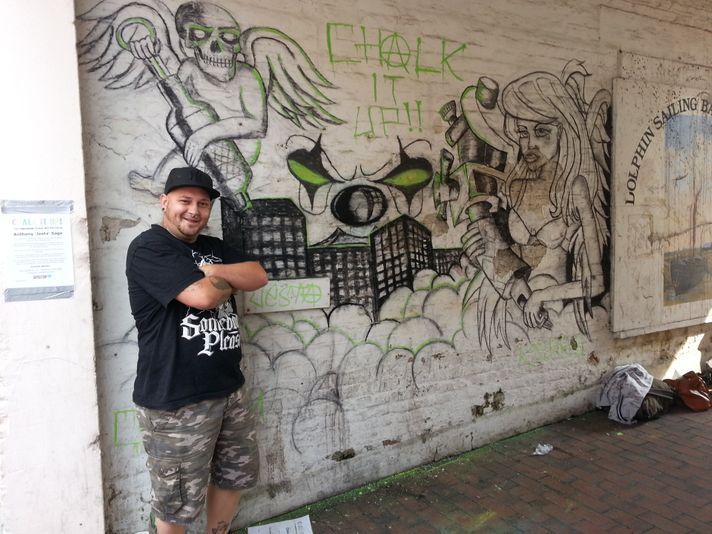 I hot footed it down the High Street where the cleaning manager of the Bell Centre hadn’t been informed about the event and was threatening to call the police as Nikki was ‘doing graffiti’ on the walls he was supposed to keep clean. A quick call to his boss and the situation was cleared up but I think it left Nikki a bit shaken as she kept complaining that her Dalek had gone a bit wonky. Sunday saw just as much enthusiasm from my artists as they returned the next morning to carry on with their artwork. 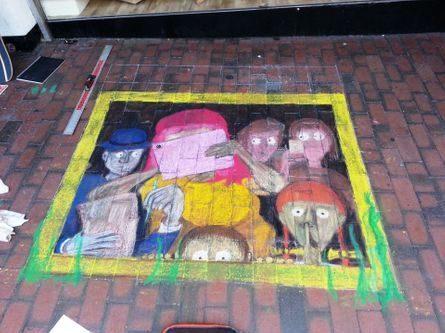 By now they all knew what to do which was great as it allowed me to start on the 3D mural on the floor of Roman Square. This day wasn’t so taxing on my nerves, but with the mural on the floor at 20 foot wide and over 50 foot long, it did test my back and knees. I would like to say a special thank you to Chris Swain, Laurie Harper, Boo Barber, Russell Wood, Julie Bradshaw, Jordan Spooner and of course, the hard working Jaime Richards who worked their fingers to the bone helping me create this spectacle. I do think we have started something special this weekend. The response was overwhelming on the day and the exposure on social media has been incredible. I do see this being an annual event. It would be foolish for us not to capitalise on this success and do it again, but next year it will be even better! We should make it more festival like with music and food. 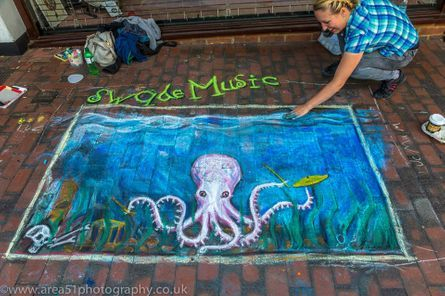 We need to get more artists involved and I have a few more chalk related ideas that I want to develop. Any ideas or suggestions you may have for next year are more than welcome. 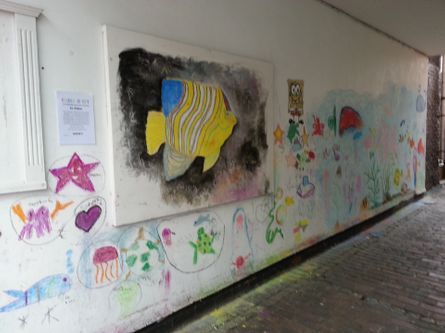 We have proved that there is an art community in Sittingbourne that is inclusive of all. Let’s build on that and give people a reason to visit our town. Mel Hanson I would love to do this again!! Had a great weekend thank u for arranging it! 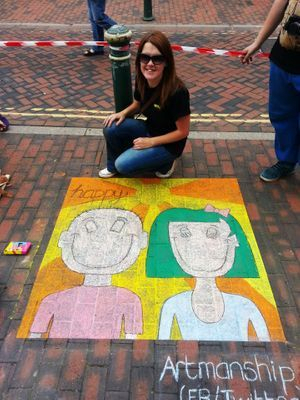 Emma Foxley Had an awesome day yesterday collaborating with Felted Thoughts we had an alleyway in #sittingbourne which we turned into a happy colourful woodland with an angel. 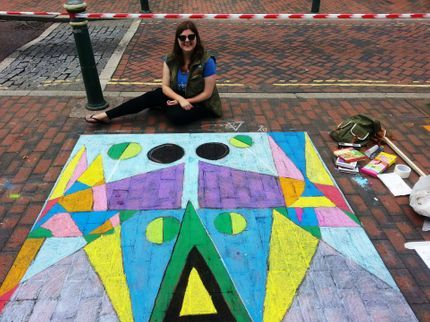 It was great to use chalk on such a large scale as part of the #chalkitupfesitval hosted by Marvellous Murals it was such a great event and hope it continues next year! Thank you for letting is be part of it! Amber-Marie Bates So as I have not long finished work I thought I would finally upload my finished piece, fair to say I impressed myself as it was my first time using chalk, it is the first time any of my artwork is on show and I am extremely happy with the outcome! I'm so proud of myself and everyone else what an amazing opportunity Sittingbourne will be a brighter place for a short while, thank you all for the support! Sioux Peto I know it’s not over yet Dean Tweedy but you were awesome today - and we all want to thank you big time for all your hard work and effort that you have put into this. We all had such a great totally great time - WELL DONE YOU - Sittingbourne so needed this it looking amazing. 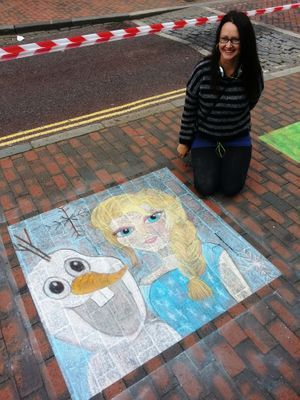 Nicola Susan Lockshire-Green Had a little trip down the High Street late this afternoon to check out the artwork and saw lots of others doing the same! ) Great stuff! 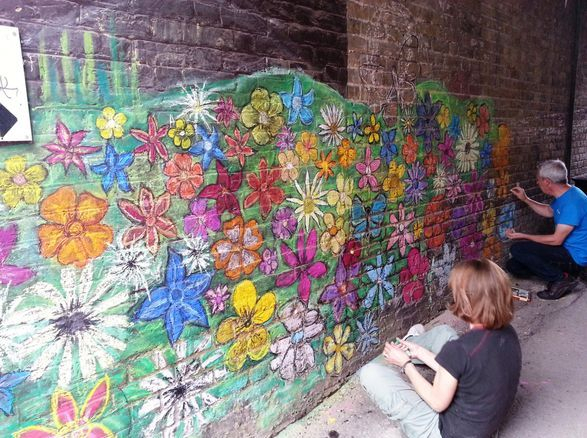 I particularly like the ones in the dark alleyways - brings so much colour and life to every corner! Would love to be involved next time. Matthew Judd Just walked down the high street to look at all the pieces, so many cars are parking up and getting out to have a look! It all looks amazing! Well done all involved! Jean Farquharson Fabulous, I hope the weekend can be repeated next year. Lisa Carpendale Such amazing work, please can this happen in every town and city?! Dave Wood Really wonderful event which brought a new vibrancy to the town. It's great that people are now doing something real to bring Sittingbourne back to life rather than just moaning. Well done to all the artists and Dean for organising this great weekend. Emily Cooper Artworks Brilliant, just brilliant! I went and had a look on Sunday. 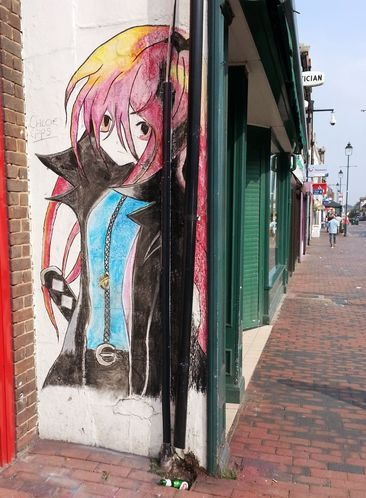 So good to see Sittingbourne with an art movement going on. Would love to get involved if you do anything like is again. Thank you to the organisers and artists, a great thing to see.